In a previous post, we saw how most of Mexico’s volcanoes are located in a broad band that crosses central Mexico known as the Volcanic Axis (Eje neovolcánico). In this post, we provide brief descriptions of some of the major volcanoes in Mexico. Starting in the west, the first active volcanoes are Everman and Barcenas in the Revillagigedo Islands. Two of the westernmost volcanoes on the mainland are near Colima. At 4260 m (13,976 ft), the inactive Nevado of Colima, Mexico’s sixth-highest peak, is as tall as the highest mountains in the contiguous USA. Its younger brother, Colima Volcano (or Volcán de Fuego) is lower (3820 m) but highly active and considered potentially very dangerous. It has erupted in cycles for several hundred years, and is capped by a dacitic plug characteristic of a silica-rich Pelean volcano. Such volcanoes have the potential to erupt suddenly, not emitting vast quantities of molten lava, but shooting out less spectacular, but far more devastating, clouds of red‑hot asphyxiating gasses. Tequila Volcano, overlooking the town where the beverage is distilled, is also in Jalisco. In neighboring Michoacán state, the most noteworthy volcanoes are Jorullo (which last erupted in 1759) and Paricutín, which began life in a farmer’s field in 1943 and ceased activity in 1952, but only after its lava had overwhelmed several small villages. Closer to Mexico City, the Nevado of Toluca (4680 m) has a drive-in crater and is a favored destination for Mexico City families in winter to take their children to play in the snow. It is Mexico’s fourth highest peak (see table below). Continuing eastwards, we reach several other volcanoes that are among Mexico’s highest volcanic peaks (and are also included in the table). The most famous volcano in the Volcanic Axis is the still active Popocatepetl (“Popo”), which rises to 5500 meters (18,045 feet). Alongside Popocatepetl is the dormant volcanic peak of Iztaccihuatl (5220 m or 17,126 ft). On a smog-free day, both are clearly visible from Mexico City. 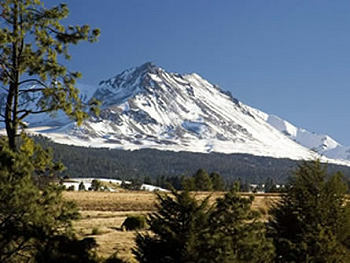 The southern suburbs of Mexico City are overshadowed by a smaller active volcano, Ajusco, which reaches 3930 m (12,894 ft). The Pico de Orizaba, a dormant volcano on the border between states of Veracruz and Puebla, is Mexico’s highest mountain. At 5610 m (18,406 ft) it is the third highest peak in North America. By way of contrast, not very far away, in the outskirts of the city of Puebla, is the world’s smallest volcano! Only a few volcanoes appear to be located outside the Volcanic Axis and therefore in an anomalous location to the general pattern. They include two volcanoes in Chiapas which lie south of the Volcanic Axis: El Chichón (which erupted in 1982) and Tacaná (4080 m). Why is biomass density in Mexico relevant to climate change? Maps, Other Comments Off on Why is biomass density in Mexico relevant to climate change? How can we measure the health of forests and other forms of natural vegetation? It has become commonplace to read about biodiversity and many conservation programs rightly stress its importance in the global scheme of things. In a previous post, we examined the biodiversity of Mexico and saw how it is one of the most biodiverse countries in the world. Biodiversity may be a useful indicator of likely ecological resilience in the face of changing circumstances such as global climate change, but it does not tell the whole picture. In simple biodiversity measures, each species is counted and treated as being equally important. Species close to extinction are singled out for conservation efforts in an attempt to preserve a viable wild population of that species. If all else fails, specimens are transferred to botanical gardens or seeds are collected and stored in the hope that the species can be reintroduced and reestablished in a suitable location at some point in the future. 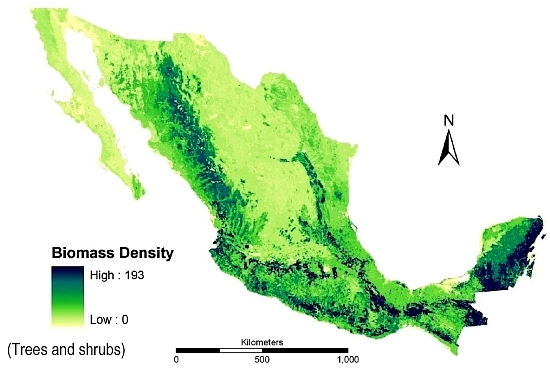 Biomass density in Mexico (trees and shrubs); from deJong et al, 2006. But are all plant species equal? Should a giant redwood count the same as a dandelion? Certainly in terms of their ability to store carbon, larger plants are more valuable than smaller plants, though the total number of each species also matters. Storing carbon is important. When trees are cut down and burned (to clear the way for agriculture or settlement, for example) this stored carbon is released into the air and contributes to the processes causing global warming. The term biomass is used to describe the total mass of living organic matter in a plant or in an area. The total biomass of a plant includes its bark, leaves and twigs. In a tropical forest, biomass includes every tree, shrub, sapling, vine, epiphyte and flower. About 50% of the biomass in most forests is carbon. The amount of biomass varies seasonally and is not necessarily stable over time, since plants increase their biomass as they grow. In a forest, the balance that matters in terms of sustainable forestry is the balance between the forest’s production of “new” biomass (through photosynthesis) and the consumption of some of its biomass by chopping, burning and natural decay. Clearly, human activity can directly impact this balance, but so too can natural events such as forest fires. Bio-geographers have a great interest in assessing biomass since it provides a starting point for numerous models that attempt to estimate the effects of releasing some, or all, of this stored carbon on future global climates. Increasingly, their estimates from the use of remote sensing and satellite images are proving to be quite reliable when tested by comparing them to the biomass of the same area calculated from on-the-ground fieldwork. The measure of biomass shown on the map is biomass density. Biomass density is the total amount of above ground living organic matter expressed as oven-dry metric tons per hectare. This map immediately reveals why conserving Mexico’s southern rainforests is so important. They are not only the most biodiverse areas of Mexico, their high biomass density values show that they also have far more than their fair share of Mexico’s total biomass. Conserving and managing these forests therefore needs to be a priority strategy in Mexico’s efforts to limit and mitigate climate change. The map comes from “Advances of Mexico in preparing for REDD” by Bernardus H.J. de Jong, Leonel Iglesias Gutiérrez and José Armando Alanís de la Rosa. Presentation given at the UNFCCC Workshop on Methodological Issues relating to Reducing Emissions from Deforestation and Forest Degradation in Developing Countries. Tokyo, Japan, 25 to 27 June 2008. To read more about estimating biomass, see Estimating Biomass and Biomass Change of Tropical Forests: a Primer. (FAO Forestry Paper – 134) by Sandra Brown. FAO Forestry Paper 134. 1997. Mexico’s vegetation zones. The link is to a pdf map (in color) of vegetation zones. The map (all rights reserved) is a color version of Figure 5.1 in Geo-Mexico. The standstill appears to be the result of many factors, including the weakened U.S. job and housing construction markets, heightened border enforcement, a rise in deportations, the growing dangers associated with illegal border crossings, the long-term decline in Mexico’s birth rates and changing economic conditions in Mexico. This sharp downward trend in net migration has led to the first significant decrease in at least two decades in the number of unauthorized Mexican immigrants living in the U.S.—to 6.1 million in 2011, down from a peak of nearly 7 million in 2007. Mexicans now comprise about 58% of the unauthorized immigrants living in the United States. They also account for 30% of all U.S. immigrants. Apprehensions of Mexicans trying to cross the border illegally have plummeted by more than 70% in recent years, from more than 1 million in 2005 to 286,000 in 2011—a likely indication that fewer unauthorized immigrants are trying to cross. As apprehensions at the border have declined, deportations of unauthorized Mexican immigrants—some of them picked up at work or after being arrested for other criminal violations—have risen to record levels. In 2010, nearly 400,000 unauthorized immigrants—73% of them Mexicans—were deported by U.S. authorities. Looking back over the entire span of U.S. history, no country has ever sent as many immigrants to this country as Mexico has in the past four decades. However, when measured not in absolute numbers but as a share of the immigrant population at the time, immigration waves from Germany and Ireland in the late 19th century equaled or exceeded the modern wave from Mexico. Where do most foreigners live in Mexico? Popocatepetl is Mexico’s second largest volcano, after El Pico de Orizaba. Popocatepetl rises to a height of 5500 meters (18,045 feet) and is located approximately mid-way between Mexico City, about 80 kilometers (50 miles) to the northwest, and the city of Puebla, a similar distance to the east. 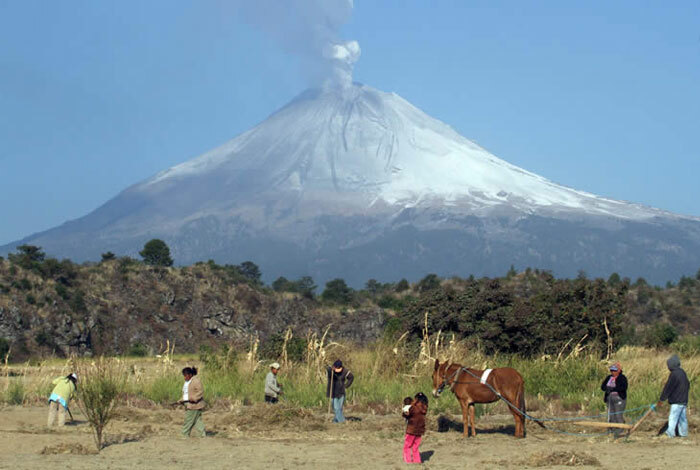 In the past week, Popocatepetl (aka “Popo” or “Don Goyo”) has sprung back into life, blowing off steam and ash in a series of minor eruptions, accompanied by minor earth tremors, many of which registered between 3 and 4 on the Richter scale. Incandescent rocks (“volcanic bombs”) have been thrown up to 1000 meters (3000 feet) from the crater down the slopes of volcano, and water vapor, gasses and ash have formed towering clouds, up to 2000 meters high, rising above the iconic volcano. The latest eruptions of Popocatepetl come from an estimated sixty different vents that are connected to a magma chamber 10 km (6 miles) beneath the volcano that is thought to hold upwards of 1,000,000 cubic meters (36,000,000 cubic feet) of magma. On the one hand, the small eruptions are good news, since they relieve the pressure building up underground, at least temporarily. On the other hand, they may presage a much more serious and major eruption. Thousands of families live in the farming villages on the lower slopes of the volcano; some 25 million people live within a 100 kilometer (60 mile) radius. In the event of a major eruption, and depending on wind directions, airborne ash could fall on Mexico City, interrupting normal activities and Mexico City’s busy international airport, or on the Metropolitan area of Puebla (population 2.7 million), an important industrial center, where Volkswagen has its main vehicle factory. Even though geophysicists are unable to say whether or when a major eruption will actually occur, authorities have raised the threat level and taken steps to ensure that local residents can be safely evacuated, if necessary, to emergency shelters in nearby public buildings such as schools. Almost 200 temporary shelters have been prepared in nearby villages to house any people that are forced to leave their homes. Mexico’s National Disaster Prevention Centre (El Centro Nacional de Prevención de Desastres, Cenapred) has raised the alert level to “yellow stage three” – the third highest level. This level indicates that a magma expulsion is possible and that the intensity of explosions is likely to increase. In the event that the alert is raised still further, into the red zone, villages within a 12-km zone will be immediately evacuated, and the exclusion zone may be extended still further if this is deemed a prudent safety measure. During the last major evacuation, in 2000, nearly 50,000 residents in three states were moved into temporary shelters. As in the case of previous volcanic eruptions in Mexico, such as Paricutín in the 1940s, the Mexican Army would take charge of ensuring that local residents are taken to safety. Roads are being kept open, and emergency repaving is underway, in case an evacuation is required. Local villages are arranging to have sufficient buses standing by to ensure that their residents can be evacuated rapidly should the alert level be raised. Even so, it is unlikely that everyone would choose to leave, and it is thought that up to half the population might attempt to remain in their homes even if the alert level is raised. Health authorities have already distributed free face masks and bottles of water to families in the area. The cloth face masks are intended to filter out the fine ash released by the volcano, and reduce the likely increase in respiratory problems. Falling ash is also expected to lead to an increased incidence of allergic conjunctivitis. Authorities in the city of Puebla have temporarily suspended open air activities until further notice since much of the city has received a thin layer of ash. Ash falls of about one centimeter have been reported in some districts of the city. Ash has also fallen over the nearby town of Cholula and as far away as Atlixco and Huejotzingo. Puebla hoteliers, restauranteurs and merchants will be hoping that the city’s restriction on open air activities ends quickly, since the city is gearing up for the annual festivities associated with the 5 de Mayo (5 May) festival for which the city is famous. (The festival commemorates Mexico’s victory over French forces at the Battle of Puebla on 5 May 1862). How much drugs money is laundered in Mexico each year? Other Comments Off on How much drugs money is laundered in Mexico each year? Despite this being an obvious question, there is no simple or generally accepted answer! However, a document published last month by Centro de Estudios Sociales y de Opinión Pública de la Cámara de Diputados (CESOP), entitled Lavado de dinero: indicadores y acciones de gobierno binacionales (“Money Laundering: bi-national indicators and government actions”) does offer some clues and estimates. For example, according to Mexico’s tax authorities (SHCP), the nation’s financial system “gained” at least 10 billion dollars last year from unrecorded, presumably illicit, activities such as drug trafficking. North of the border, the US State Department believes that money laundering in Mexico accounts for between 8 billion and 25 billion dollars a year, while figures as high as 29 billion dollars have been offered in the US Congress. Financial models developed by Global Financial Integrity and Columbia University in the City of New York suggest that the total “gains” from all forms of illegal activities in the USA are about 196 billion dollars (1.36% of US GDP), and that about 90% of this amount is laundered each year. The same models, applied to Mexico, suggest total crime-related profits of 38 billion dollars (3.6% of Mexico’s GDP), only 10-14 billion dollars of which is laundered into the formal economy. If the models are to be believed, in the USA, 46% of the total amount laundered derives from drug trafficking, 32% from people trafficking, 15% from pirated goods and 7% from fraud. In Mexico, 41% of laundered money originates from drugs, 33% from people trafficking, 20% from pirated goods and 6% from fraud. Despite the considerable variation in numbers, most of the figures and calculations fall within, or close to, the range of values (between 2 and 5% of global GDP) that is estimated by the International Monetary Fund to be laundered each year around the world. Mexico’s active seismic zones have created numerous volcanoes, many of which are still active. Virtually all the country’s active and recently dormant volcanoes are located in a broad belt of high relief which crosses Mexico from west to east: the Volcanic Axis (see map). Altitudes in this region vary from a few hundred to several thousand meters. The principal peaks are shown on the map. They include many of Mexico’s most famous mountains, such as Popocatepetl and Iztaccihuatl, near Mexico City; Pico de Orizaba, Mexico’s highest peak; Paricutín, the only completely new volcano in the Americas in recent times; and Colima, considered the most active at present. Many of the volcanoes are surprisingly young. For instance, a study using Carbon‑14 dating on the palaeosols (ancient soils) under 12 volcanoes in the Toluca area yielded ages ranging from 38,600 to 8400 years before present. It is unclear precisely why this broad belt of Mexico should be so active. Elsewhere in the world all major tectonically active areas have been linked in terms of their location to the margins or meeting‑zones of tectonic plates. Some Mexican geologists believe that Mexico’s Volcanic Axis is a rare example of activity associated with a gently dipping plate margin, one where the edge of the Cocos plate is subsumed, but at only moderate gradient, beneath the North American plate. Almost all the volcanic activity in this zone has taken place in the last 25 million years, from the upper Oligocene period, through the Miocene and Pliocene and up to Recent. Two distinct periods of activity are recognized by some geologists. The first, in the late Oligocene and early Miocene, produced volcanic rocks often found today tightly folded by later earth movements. The second, responsible for all the major composite cones as well as dozens of ash and cinder cones, started in the Pliocene and continues today. Erosion has had relatively little time to work on these “new” volcanic peaks, some of which are still developing. As a result, this region includes Mexico’s highest mountains, reaching over 5500 m or 18,000 ft. Thick, lava-rich volcanic soils make this one of the most fertile areas in North America. Though the relief is very rugged, this area has supported relatively high population densities for hundreds of years, including the current large metropolitan areas of Mexico City, Guadalajara and Puebla. Legacies of previous volcanic activity are found in craters, mud‑volcanoes, geothermal activity, and the numerous hot springs (and spa towns) scattered throughout the Volcanic Axis. In just 20 years, Mexico has gone from a nation that needed to import less than 400,000 metric tons of corn (maize) a year in order to satisfy its domestic market to one where, in the 2011-12 season, it will need to import almost 10,000,000 tons. One producers’ organization, Mexico’s National Confederation of Maize Growers (CNPAMM), argues that this reliance on imports has relegated the work done by its members to a relatively minor role in providing the nation with food. The growers claim that the price they receive for corn (post-NAFTA) has declined in the face of cheaper imports, jeopardizing their livelihoods. (For one view of the changes post-NAFTA, see NAFTA Truth and Consequences: Corn). On the other hand, in the past few years, the costs of imported corn have risen sharply, meaning that consumers have to pay more for their tortillas. In order to preserve some stability, the Mexican government has bought corn futures which guarantee corn prices for a period of time. How is it possible that the country that gave the world corn is now so dependent on imports of corn, almost all of which come from the USA? According to the CNPAMM, it is the result of speculation, market distortion and failures in Mexico’s economic policy. Héctor Carlos Salazar, the president of CNPAMM, called on maize growers to demand better prices, a reduction in imports, and some guarantees from the politicians fighting this year’s federal elections that they will take steps to ensure Mexico’s self-sufficiency in foodstuffs. Salazar has been quoted in the press as offering some interesting statistics for the impacts of every additional ton of corn that Mexico imports from abroad. He claims that each ton imported reduces agricultural employment by 4.54 man-hours. It also reduces other inputs: diesel by 6 liters, fertilizers by about 100 kg, insecticides by 1 liter, pesticides by 3 liters and improved seeds by about 4 kg. The bottom line is that it is not just the food security, particularly of Mexico’s poorest, that is threatened by rising corn imports, it is also Mexico’s economy. Is this the beginning of the end for blue corn tortillas? 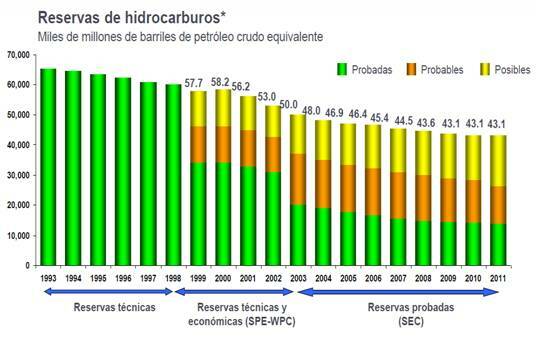 Other Comments Off on How long will Mexico’s oil reserves last? Excerpts from Geo-Mexico Comments Off on How has the movement of tectonic plates affected Mexico? 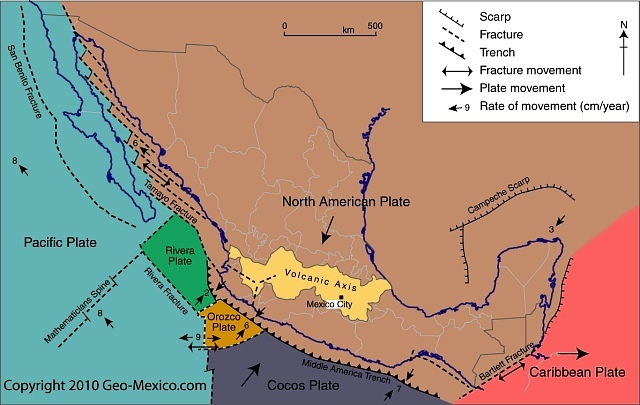 In a previous post, we identified the tectonic plates that affect Mexico. In this piece, we look at some of the major impacts of Mexico lying on or close to so many different plates. To the east of Mexico, in the last 100 million years, outward expansion from the Mid-Atlantic Ridge (a divergent boundary) first pushed South America ever further apart from Africa, and then (slightly more recently) forced the North American plate (and Mexico) away from Eurasia. The Atlantic Ocean continues to widen, expanding the separation between the New World and the Old World, by about 2.5 cm (1 in) each year. Meanwhile, to the west of Mexico, an analogous situation is occurring in the Pacific Ocean, where the Cocos plate is being forced eastwards away from the massive Pacific plate, again as a result of mid-ocean activity. The Cocos plate is effectively caught in a gigantic vice, its western edge being forced ever further eastwards while its leading eastern edge smacks into the North American plate. The junction between the Cocos and North American plates is a classic example of a convergent plate boundary. The collision zone is marked by a deep ocean trench, variously known as the Middle America trench or the Acapulco trench. Off the coast of Chiapas, this trench is a staggering 6662 m (21,857 ft) deep. The trench is formed where the Cocos plate is forced to dive beneath the North American plate. As the Cocos plate is subducted, its leading edge fractures, breaks and is partly re-melted into the surrounding mantle. Any cracks in the overlying North American plate are exploited by the molten magma, which is under immense pressure, and as the magma is forced to the surface, volcanoes form. The movement of the plates also gives rise to earthquakes. The depth of these earthquakes will vary with distance from the deep ocean trench. Those close to the trench will be relatively shallow, whereas those occurring further away from the trench (where the subducting plate is deeper) will have deeper points of origin. As the plates move together, sediments, washed by erosion from the continent, collect in the continental shallows before being crushed upwards into fold mountains as the plates continue to come together. A line of fold mountains stretches almost continuously along the west coast of the Americas from the Rocky Mountains in Canada past the Western and Southern Sierra Madres in Mexico to the Andes in South America. Almost all Mexico’s major mountain ranges—including the Western Sierra Madre, the Eastern Sierra Madre and the Southern Sierra Madre—formed as a result of these processes during the Mesozoic Era, from 245 to 65 million years ago. However, no sooner had they formed than another momentous event shook Mexico. About 65 million years ago, a giant iridium-rich asteroid slammed into the Gulf of Mexico, close to the Yucatán Peninsula, causing the Chicxulub Crater, and probably hastening the demise of the dinosaurs. An estimated 200,000 cubic km of crust was pulverized; most of it was thrown into the air. The resulting dust cloud is thought to have contributed to the extinction of up to 50% of all the species then on Earth. Not only did this event have an enormous impact on all life forms on Earth, it also left a legacy in the Yucatán. The impact crater is about 200 km (125 mi) across. Its outer edge is marked by a ring of sinkholes (locally known as cenotes) and springs where the fractured crust provided easy access to ground water. These locations include the ria (drowned river valley) of Celestún (now a UNESCO Biosphere Reserve), where fresh water springs mingle with salt water to create an especially rich habitat for birdlife. In the 65 million years since the asteroid impact (the Cenozoic period), the remainder of Mexico has been formed, including many of the plateaus and plains, and the noteworthy Volcanic Axis, which owes its origin to still-on-going tectonic activity at the junction of the North American and Cocos plates. Two major earthquakes in two days! Fortunately, they struck in different sections along Mexico’s west coast, meaning that few if any people were shaken by both. The first earthquake struck in Michoacán on 11 April, and was felt over a wide area of central Mexico. This earthquake registered 6.5 on the Richter scale (preliminary estimates had originally suggested it was magnitude 7.0). 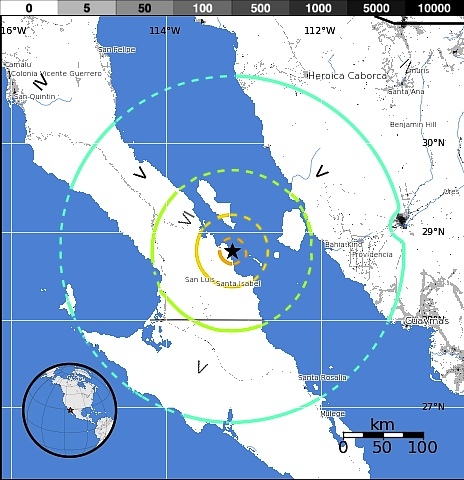 The epicenter was about 61 km (38 miles) NW from Lázaro Cárdenas, Michoacán, 130 km (80 miles) SSW from Uruapan, Michoacán, and 143 km (88 miles) NW of Zihuatanejo, Guerrero. This placed it relatively close to the community of La Mira in the state of Michoacán. Only minor damage was reported following this earthquake, despite its magnitude. The following day (12.15 am local time on 12 April), an even larger earthquake, magnitude 6.9, hit further north in Mexico, close to the coast of Baja California. Its epicenter was 183 kilometers (113 miles) from Santa Rosalia (Baja California Sur) and 214 kilometers (132 miles) from Hermosillo (Sonora). This meant that its effects were greatest in areas where population is very sparse (see map), and fortunately, once again, there were no reports of any loss of life or major damage. These two earthquakes come less than a month after the major magnitude 7.4 earthquake that hit the states of Oaxaca and Guerrero on 20 March 2012. This ‘quake caused significant damage – and was followed by dozens of aftershocks, including one on 2 April that registered 6.0 on the Richter scale. Now that several parts of this junction of tectonic plates have shifted in quick succession, everyone hopes that these earthquakes will have relieved enough pent-up pressure, and re-adjusted the plates sufficiently, to prevent further earthquakes in the region in the near future.